Mark Bittman is awesome. I received his outstanding book, How To Cook Everything, as a gift about ten years ago and it is by far the most heavily-used cookbook in my modest collection (see photo). If you do not own this book, you need to purchase it now. Bittman’s style is casual and very simple. The recipes are no-nonsense, and usually extremely easy. Another great thing about this book is that it often gives a long list of variations on a common recipe theme. For example, he includes 7 basic vinegrette recipies, then offers “Fifteen simple additions to vinagrettes”. So, in just a few pages, you have the building blocks to create countless vinegrettes of your own design. The beauty of this is that it gives you guidelines, while still allowing you to be creative, and work with ingredients you have on hand. Anyway, this is just a long-winded introduction to Bittman’s 101 Fast Recipes for Grilling in the New York Times. 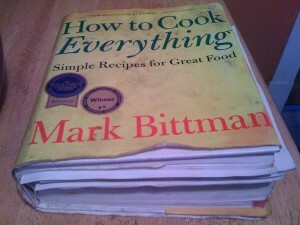 True to his style, Bittman offers a bounty of recipes, most of which are no more than a short sentence or two. This is my kind of recipe. Don’t miss the Recipes for Summer Grilling with mouth watering photography and links to even more great grilling recipes. This is gonna keep me busy for a while. Summer’s here, let’s get grillin’. Having lived in New York City for a number of years, I became quite fond of Neapolitan brick-oven style pizzas, such as those served at Lombardi’s, the oldest pizzaria in the United States (opened in 1905). While I love pizza’s many styles, my favorite has a thin NYC-style crust and is light on the toppings. While quality sauce and cheese are important, I’m a firm believer that the crust makes the pizza. I have discovered, over the past year, that the Big Green Egg makes an amazing pizza, particularly when it comes to crust quality. 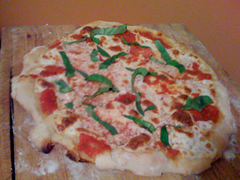 My favorite toppings are simple: Puréed tomatoes, fresh mozzarella and basil leaves. Amazing pizza dough is easier to make than you might think: Use approximately 4 parts high-gluten (bread) flour to one-part semolina flour (optional). Add 2/3rds of your flour to enough water to make a thick batter (not dough yet). Toss in a tablespoon of yeast and a dash of olive oil (optional). Let this batter rest for 20 minutes or so and gently knead in the rest of your flour until a nice dough-like consistency is reached. Form into balls and let this dough rise over a few hours, punching down once and re-forming balls if you’d like. Once the dough has doubled in size, its ready to use. Fire up your egg at full bore (600+°F) and give your pizza/baking stone plenty of time to heat up completley. If you dont have a baking stone, get one now . This extremely hot dry stone will rapidly cook your crust to perfection. In general my pizzas are bubbling hot and fully cooked in under 10 minutes, often in 5. The Bacon Method. ‘Nuff said. Green Eggs and Hamburgers: The Cult of the Big Green Egg featured in the New York Times. Dave’s Ghost Pepper Naga Jolokia Hot Sauce, reviewed. If my Bittman post wasn’t enough. You’re sure to get your fill from the New York Times’ Grilling Recipes. I need another stomach. The Royal Masonic Illuminati Skeleton Priory of Big Green Eggs. Get your Big Green Egg photo fix here. Bacon Explosion: The BBQ Sausage Recipe of all Recipes. Lord have mercy. This breaded grilled “almost fried” chicken wings recipe is easy and delicious! The Burger Lab at AHT has done some research and has come up with instructions on re-creating NYC’s famous Shake Shack burgers at home. Many details are covered including the bun, the meat blend, toppings, sauce and assembly. Burger David vs. burger Goliath: Eden Prarie, MN burger joint, Lion’s Tap, files a lawsuit against McDonald’s for ripping off their established “Who’s Your Patty?” slogan.